Watch the video (1m 52s) to start adding customers to your QuickBooks. You can enter your customers in a couple of different ways. When you first go to Customers, you can add your customers by just entering their name, phone number and email. You can go back to the customer record later to enter more details about this customer. Go to Sales > Customers. 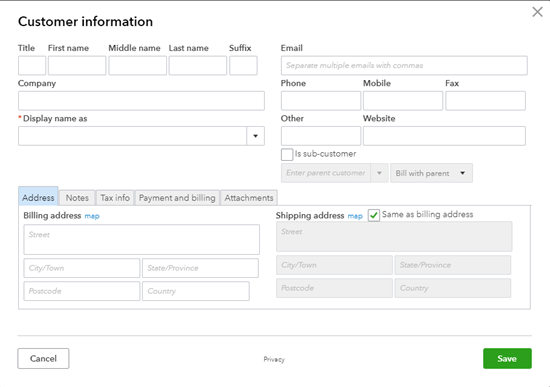 Fill in the fields in the Customer Information window. Enter additional information on the Other details, Tax info, and Payment and billing tabs, if necessary. Click Save. The customer name appears in the list. If you have a spreadsheet with your customer info, you can import that spreadsheet into QuickBooks all at once. Before you get started, prepare your customer list in excel to make sure that the column titles and the order of the columns in your excel sheet matches our example. Download our excel file sample and take a look at it. Click on the little arrow next to New Customer > Import Customers. Click Browse, select your excel file and Open, then Next. For each of the QBO fields on the screen, choose one of your excel columns. This action tells QuickBooks which columns in your excel spreadsheet get pulled into which QuickBooks field. Click Next when you have completely mapped your fields to QuickBooks's. The next page shows your data and where it's going into QuickBooks. Make sure you check the box on the left for all the items you want to import. When you're ready, click on Import.